Put egg in one dish and breadcrumbs, parmesan cheese, and basil in another. Dip chicken in egg and gently press each side of the chicken into breadcrumb mixture. Place chicken in a sprayed baking dish and bake, uncovered, for 25-30 minutes or until chicken reaches 165 degrees. Pull chicken from oven and put 1/4 cup sauce over each serving. Layer 1/2 piece of cheese over the sauce. 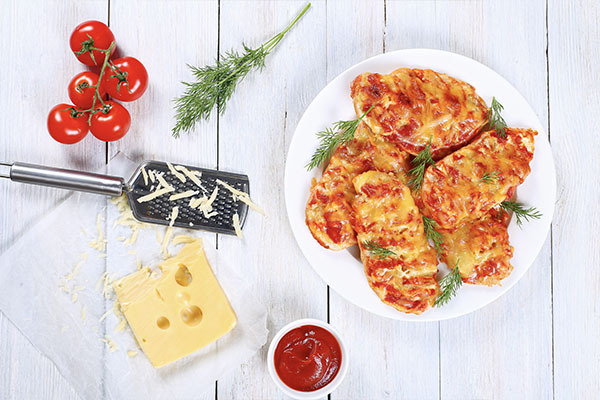 Broil chicken until cheese is bubbly and slightly browned. Toss with butter, garlic salt, and pepper. Evenly divide into four servings. Serve each piece of chicken with an equal portion of the broccoli.